A schematic description of the SIMP paradigm. Credit: Hochberg, Y et al. (2014) Mechanism for Thermal Relic Dark Matter of Strongly Interacting Massive Particles. Phys. Rev. Lett. 113, 171301. (Phys.org)—Our current understanding of the universe is that the majority of its mass consists of dark matter (DM) – but there's a wrinkle: Despite having an idea about some of its properties – dark matter is cold, massive, has neither color nor electrical charge, and does not self-interact very strongly, so that it is detected through its gravitational interactions with ordinary matter and radiation – scientists don't know what dark matter actually is. That said, and as might well be expected, dark matter theories abound, one being that dark matter is a thermal relic from the early universe, in which all particles are in thermal equilibrium until expansion and cooling occurs. At that point, particle interaction rates slow, causing them to freeze-out – and while unstable particles vanish, stable particles reach what's known as their thermal relic density that remains. In this scenario, the most promising dark matter candidates are weakly interacting massive particles (WIMPs) – but even though extensions of the standard model often include such particles, no particle known today matches WIMP properties. 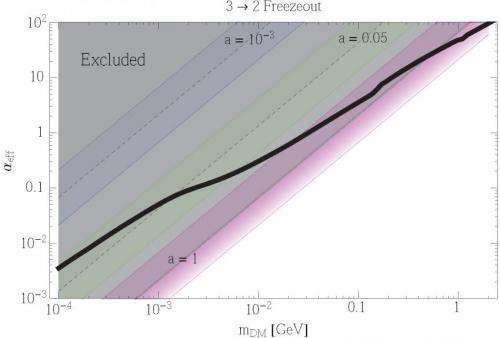 Recently, however, researchers at University of California, Berkeley, Tel Aviv University, Israel and Stanford University presented a new thermal relic dark matter mechanism which arises when a nearly secluded dark sector – a grouping of new particles that don't couple directly to the Standard Model – is thermalized (that is, attains thermal equilibrium) with the Standard Model after reheating. The new mechanism differs from previous thermal relics in proposing not WIMPs, but SIMPs (strongly interacting massive particles) as dark matter particle candidates, as well as implying that measurable signals will be observable with future indirect- and direct-detection experiments in the near future, as well as through dark matter production in next-generation colliders. Dr. Yonit Hochberg discussed the paper that she and her co-authors Dr. Eric Kuflik, Dr. Tomer Volansky and Prof. Jay Wacker published in Physical Review Letters. "When people think about dark matter, what they often have in mind is the WIMP – a massive particle mass around 1-1,000 times the mass of the proton that weakly interacts with itself and other particles," Hochberg tells Phys.org. "In this picture, the relic population of dark matter particles in our universe today is produced by what is termed a 2 → 2 process in which two dark matter particles collide and annihilate, generating two ordinary matter particles." Hochberg adds that the rate at which this process occurs depends in part on how strongly dark and regular matter interact, in that interaction strength and process rate vary directly. "Such WIMP dark matter particles have been the dominant candidate for dark matter for the last 35 years," she continues. "Although we've been searching for these WIMPs in a variety of different ways, we still haven't found them – so it's important to use our imagination: What would happen if the dark matter was really secluded from the visible ordinary particles? Can a thermal relic population of dark matter still exist? What would its mass be? How would it interact with ordinary matter?" Hochberg points out that if dark matter really is secluded from visible matter, a mechanism that can change the number of dark matter particles is a 3 → 2 process, in which when three dark matter particles collide and produce two dark matter particles. What's important is that this process doesn't depend on interactions between the dark and regular matter; rather, it depends entirely on the self-interaction strength and number of the dark matter particles themselves to determine whether or not the collision takes place. For dark matter particles that interact with each other almost as strongly as quarks interact with themselves, and that have mass between the proton mass a 1/1000 the proton mass, this 3→2 process will leave a relic dark matter population in the universe today in agreement with observations. "However," Hochberg says, "this 3 → 2 process heats up the dark matter such that it can't be completely secluded from ordinary matter. The dark matter particles must be able to interact with other particles in order to cool themselves, meaning that there have to be interactions between dark and ordinary matter." A dark matter candidate of this sort – a SIMP – is vastly lighter than the WIMP, and interacts strongly with itself and weakly with ordinary matter. "One might worry that if the dark matter cools itself by interacting with the visible matter, then the dark matter might also be able to annihilate itself away into ordinary matter through these same interactions. If this were the case we'd be back to WIMPs, so the question is Can dark matter cool but not annihilate? "A priori," Hochberg reasons, "the same interactions that cool dark matter enable it to annihilate into ordinary matter. However, the key is that the rate of a process depends not only on the strength of the interaction between the particles, but also on how abundant the colliding particles are. For dark matter to cool, it has to scatter off of ordinary matter, which is abundant, while for dark matter to annihilate, it has to interact with another dark matter particle, of which there aren't that many." In other words, during the early universe dark matter could cool by transferring heat into ordinary matter without annihilating into it because there were many more photons, electrons and neutrinos than dark matter – so if dark matter interacts with these particles it can cool without annihilating. "The strength of this interaction is small, but not arbitrarily small," Hochberg adds. "If this interaction is too weak, dark matter can't cool itself sufficiently; if this interaction is too strong, annihilation of dark matter into ordinary matter is more important than the 3 → 2 self-annihilations and we're back to WIMPs. SIMP dark matter therefore requires sizable interactions in a particular range between dark and ordinary matter – interactions that can be probed by current and upcoming experimental efforts." αeff vs DM mass (black solid line), derived from the numerical solution to the Boltzmann equation in the 3 → 2 freeze-out scenario. The colored regions show the preferred region for the “core vs cusp” and “too-big-to-fail” anomalies for a = 1 (magenta), a = 0.05 (green), and a = 10−3 (blue). The region above the gray-dashed lines is excluded by the bullet-cluster and halo shape constraints, for each value of a. Credit: Hochberg, Y et al. (2014) Mechanism for Thermal Relic Dark Matter of Strongly Interacting Massive Particles. Phys. Rev. Lett. 113, 171301. The paper characterizes the proposed SIMP mechanism as a new dark matter paradigm rather than a specific dark matter candidate, pointing toward the next step: exploring models for the SIMP mechanism. "We've presented a novel idea for the identity of dark matter, termed the SIMP mechanism," Hochberg says. "In a more recent paper written in collaboration with Hitoshi Murayama1, we've identified classes of strongly coupled theories that give explicit realizations of SIMP dark matter." Interestingly, these are theories of dynamical chiral symmetry breaking resembling quantum chromodynamics (QCD) – the theory of strong interactions between quarks and gluons, the elements of hadrons such as protons, neutrons and pions – in which pions play the role of dark matter. "These theories generically have interactions between five dark matter particles, and so the important SIMP annihilation of three dark matter particles into two dark matter particles exists." These annihilations are the dark matter equivalent of two kaons annihilating into three pions in quantum chromodynamics. "In addition, the pions also scatter off themselves, altering predictions of structure formation in the universe. These theories are a simple and calculable realization of the SIMP mechanism." The bounds on ϵ vs mDM. In both panels, the grey regions (outlined by thick dashed lines) represent the range of parameters in which kinetic equilibrium with the SM is not maintained (lower gray region), and where the standard 2 → 2 annihilation to the SM is not subdominant to the 3 → 2 process (upper gray region). Left, coupling to electrons: Additional exclusion limits from: direct detection in Xenon10 (purple region), and the expected future bound from a germanium-based electron recoil experiment (dashed purple); CMB and low redshift data constraints for electrons (blue region); modification of Neff (red region); indirect detection of γ rays (green region); direct production at LEP for a variety of mediator mass, M, and width, Γ (solid gray). Right, coupling to photons: Additional exclusion limits from: indirect detection of γ rays (green region); conservative CMB and low redshift data constraints (blue region); modification of Neff (red region). Credit: Hochberg, Y et al. (2014) Mechanism for Thermal Relic Dark Matter of Strongly Interacting Massive Particles. Phys. Rev. Lett. 113, 171301. Hochberg says that there are two necessary ingredients for SIMP dark matter: dark matter particles must interact strongly with themselves, which she stresses is crucial for the 3 → 2 self-annihilations of dark matter needed to explain the observed amount of dark matter today; and dark matter must interact weakly, but not too weakly, with ordinary matter, which ensures that dark matter can cool itself but not annihilate into ordinary particles. "These two key features of the SIMP mechanism imply measurable signals on many experimental frontiers that will probe this new paradigm with current and future data. Moreover, these signals are not forced into the model, but rather occur naturally. "For example," she illustrates, "the strong self-interactions of dark matter particles unavoidably give rise to distorted galaxy shapes – a prediction supported by data." "We're just starting to explore the rich phenomenology of this new paradigm for dark matter" Hochberg tells Phys.org. "In our more recent paper, we found explicit classes of strongly coupled theories that naturally have SIMPs in them, and are now working on the explicit realizations of the interactions between dark and ordinary matter. Depending on the particular way in which the dark matter cools itself through these interactions, different additional experimental signals can emerge." Hochberg and her colleagues also want to understand why the SIMP mechanism mass scale is so close to that of quantum chromodynamics. "Could there be a common origin? How can 3 → 2 processes be detected on earth? We're working towards answering all these questions." In a four dimensional space, using same units, i,e, a mapping of wavelength to period, then either may be used, the time measure or the distance measure. That said defines the units of the four dimensional space, interactions of any field is relative, GR? ?, Do the math. Pick a point, locate all charges. What is charge? Feel it, nothing but push pull, hmmm, the field, it goes forever. What are these little 4D vortexes?? The Milky Way's halo is not a clump of stuff anchored to the Milky Way. The Milky Way is moving through and displacing the dark matter. Ghost particles...... interacting on the hologram universe.......or is it the other way? Are the quoted investigators able to rigorously define WIMP/SIMP entities in the simplest, irreducible representation of a binary mechanical state vector (bit function)? If not, do they really have any clue what they are talking about? BTW, why is ordinary "base-state" matter (i.e., matter that emits no EM radiation and is therefore not visible) apparently ruled out? It would be, after all, "dark". why is ordinary "base-state" matter (i.e., matter that emits no EM radiation and is therefore not visible) apparently ruled out? It would be, after all, "dark". Dark matter is defined in part as matter that doesn't absorb or emit electromagnetic radiation. Can you provide a more precise definition and examples (with links, please) of what you mean by "ordinary matter" having this property? If one person lives with the attitude to seek physical phenomenon that does not exist but is a product of the imagination and the wrong interpretation of the certain observations in the real world, in order to receive regular wages, his place is not in the science lab or university cabinet, but in department for derivatives trading of stock exchange. One of the key questions is why matter dominates antimatter in our universe, since according to the official theory has emerged by chance from nowhere thanks to some form of quantum instability as speculated by some cosmologists and without the aid of super intelligence? @RobertKarlStonjek, @viko_mx: All scientific knowledge is at some point in its history "a product of the imagination" based on observation and induction, and is given a name in order to be referenceable. However, with science and the scientific method as we now know it (emerging in the Middle Ages and accelerating in the Renaissance), along with technology that allows us to investigate levels of scale increasingly beyond our immediate sensorium, we can formulate and test those ideas in an objective, deductive and replicable manner. I am probably totally wrong, but if I understand the article, the thermal energy of the dark matter (DM) particles needs to be dissipated to normal matter. In order to do this, there must be sufficient interaction between normal matter and dark matter to transfer the thermal energy from one to the other. The mechanism suggested is 3 ==>2 vs. 2==>2 inter-action between DM particles. What I do not get is the "thermal background" aspect of this theory. I also wonder that if the 2==>2 collisions of DM particles are rare, would the 3==>2 collisions be extremely rare? The WIMP collisions would be rare in either case, and the SIMP option would increase collisions, perhaps to a detectable level, but, even so, would either of these be detectable? Last, if DM can annihilate to ordinary matter, and there is enough DM, then for a very long time a steady-state universe will exist with ordinary matter slowly adding to the existing observable universe. Hooyeei, if you postum an article with some dark matters in the title it sure brings in some good ones. I'm voting we name this 'extra-gravity-causing-stuff" rather than dark matter. All knowledge acquired by people in the field of science are the result of observations and experiments. Imagination is necessary when you need to solve problems in different areas of life. But it alone is not enough for people to understand the reality in which they live. Noisy compulsive speculations in the media for invisible imaginary phenomena such as dark matter and energy are so annoying when they are not proven experimentally and there is no reason to be in the future. The key is in the physical properties of vacuum of space and its ability to change localy its physical parameters under certain circumstances. Incomplete mathematical models can not be compensated with imaginary physical phenomena. We can only try to make them more accurate or to replace them with more successful models which can more precisely to describe the observed reality. Have the moderators abdicated? Why is Zephir still here (again)? @viko_mx: Not really. There's a reason that Einstein said that imagination is more important than knowledge: The use of observation-based induction alone leads to "knowledge" that is anything but, such as Ptolemaic cosmology and sayings like "a watched kettle never boils." Moreover, it is not the case that what we know about the structure of the physical universe is permanent fact that is isomorphic with that structure. In other words, our understanding is always metaphorical, which is why our scientific theories, while continually getting more fine-grained and precise, are periodically shown to be limited or wrong. In short, the path beyond current dogma is imagination. Yes, I write about scientific papers - but I always keep in mind that facts are consensual rather than absolute. @Selena: The underground WIMP tests didn't fail. Rather, the results contradicted results of other WIMP detection experiments. That's why they're considered controversial. then why has he been repeatedly banned for violating the site rules? "...because they have no clue, what's going on..."
"In vacuum they belong into comprehensive term: microwave background noise." The vacuum state and CBR are distinct. If you're referring to Powell and Kinney, 2008 "The pre-inflationary vacuum in the cosmic microwave background" (http://arxiv.org/...06.pdf), that addresses a theoretical vacuum state, the effects of which can be potentially discerned from the CBR. Imagination is important for solving different problems or for amusements. But science that does not rely heavily on facts obtained by multiple observations or experiments, but mostly on the imagination becomes a speculative philosophy and deviates strongly from reality over time. If scienties do not accept that the facts obtained from observations or experiments are absolute in our reality, they will never make one single sure step in science and it becomes meaningless. But after humanity has advanced technical achievements facts yet serve to a solid starting point and not depend on the mood of the scientists. If scienties do not accept that the facts obtained from observations or experiments are absolute in our reality, they will never make one single sure step in science and it becomes meaningless. Utter nonsense. If your view was correct, we'd still be living in caves. You have no understanding of imagination (as in ideation); that "facts" are not obtained from observation, but from the interpretation of and ideation about the results of the scientific method applied to observations; or of the fundamental nature of scientific discovery. Explain your view of why Einstein said that "imagination is more important than knowledge." Or are you saying that your insight exceeds his? The guy you and the sap want banned shows a better understanding of scientific concepts than either of you have. @ no-Skippy you know that is not the truth. He shows the electric-magnet-Skippys stuffs all the time why their foolishment makes no sense. And they never answer except to repeat the same stuffs they already said a matillion times already. Just because you got bamboozled by the magnet-youtube-man-Skippy you think everybody else should be bamboozled too so you won't feel lonely. Oh yeah, I almost forget. What happen to your other interweb name? You loose the passcode so you have to start over with a new one? Facts are undeniable findings of certain phenomena or relations between them in our reality, obtained by the method of direct observation or experiments. So you have senses to obtain the necessary and reliable information about the reality in which you live. If you do not believe the facts, you have no reference point in the our world. By your logic is not excluded to wonder if you are exist at all, since you think there can be a reliable source of information? I suspect that you are infected with the idea that all in this world is relative, but in reality it is not. It's nice when you decide to follow the ideas of other people, before it to consider whether these people are so right as it seems to you at first glance. In the world we live there are absolutes which can serve as the basis of our knowledge and relationships in society. "Explain your view of why Einstein said that "imagination is more important than knowledge." Or are you saying that your insight exceeds his?" Everyone can say whatever he want. So the world is so diverse and interesting. But have we to comply with all the others have said? Man therefore has intelligence to not blindly follows the ideas of others without consider them, especially when they offer unrealistic hypothesis. Man therefore has intelligence to not blindly follows the ideas of others without consider them, especially when they offer unrealistic hypothesis. Like the unrealistic claims of a man who claimed a god told him he punished all creation for EVER because a girl was manipulated by a devil that the god KNEW would twist the uneducated girls mind ? So since u wholly believe this then you wouldn't want to go against that god's punishment so logically then you would be against all doctors & nurses ? Have you been to see a doctor - have you punished them to be consistent with your belief ? So from the old testament do u also believe that david was spoken to by god in a dream ? Are ANY dreams reliable ? Do u understand the concept of "rational logic" & in context with inference & deduction, how about "balance of probabilities"
That a god that can only communicate with a man that made a claim & not anyone else for hundreds of years punished EVERYONE ? Where do you see rationality in the idea of constantly expanding flexible space that somehow magically retains its properties for billions of years in a row? Which physical process is able to import the necessary energy for this expansion and if such process exist, can we considered universe as a closed system? If it is not closed can we be sure of uniformity of its characteristics in different points of its volume? if you did not have time to think about these questions, is never too late to do it. You talk about rational thinking and is time to show that you possess such thinking. Where do you see rationality in the idea of constantly expanding flexible space that somehow magically retains its properties for billions of years in a row? Can u not imagine a deepseated property of space/time, such as Special & General Relativity (SR & GR) confirmed millions of times a day via GPS algorithms ? Which physical process is able to import the necessary energy for this expansion and if such process exist, can we considered universe as a closed system? I have a couple, one is the interaction of quantum foam with photon diffraction. There are others, subject of my book. You talk about rational thinking and is time to show that you possess such thinking. LOL yet u demand evidence in some of your posts & those if your sock Ren82. Where is evidence for a personal deity that kills 50,000 people for looking in a box, eg Graves ? You messing with dogmatism realism. Science can not rely on the power of imagination only because it becomes a philosophy. Agree that not every mature person tends to believe in ideas that even its proponents are not able to explain in details. You're not in a state to explain what the structure and properties have the cosmic vacuum, but stand to the folly idea of elastic space, because the majority supports it. If you have a diploma from a reputed university and invested a lot in it, and this diploma is the main reason for your self confidence, its normal to defend such positions. Breaking the delusions is always uncomfortable condition. In science and in life majority has never been a criterion for the quality of the ideas which defend. Breakthroughs in science are made by people who rarely take into account the ideas supported by the majority of artisans in science. You messing with dogmatism realism. Unlike dogma of a deity that can't communicate ? Science can not rely on the power of imagination only because it becomes a philosophy. Science arose from enquiry & failure of your god(s), your god did nothing to alleviate suffering EVER. Only discipline of Science succeeded when blind irrational hope of ALL religions failed dismally for thousands of years ! U still havent answered my question, are u consistent with your belief in a god that punishes EVERYONE, by U then punishing doctors/nurses for going against god - if not then Y not ? Agree that not every mature person tends to believe in ideas that even its proponents are not able to explain in details. This is Y Science always does better than (any) religion it is because "details matter". Obviously details are ignored & logic sidestepped by the robots imagining a 'personal god did it' ! A god is a Bad idea ! Y have U not thought how bad a communicator your god is - NO details ever, never, is it so smart he acts as if he doesn't exist ? You're not in a state to explain what the structure and properties have the cosmic vacuum, but stand to the folly idea of elastic space, because the majority supports it. No, its called EVIDENCE, something your god has never communicated EVER - Y is that ? No, EDUCATION at a reputed uni CONNECTS theory with Evidence, again something your idea of a god can NEVER achieve ! Please put the idea of ANY personal god in the dustbin of history, he/she/it has kept us in the dark for millennia ! Breaking the delusions is always uncomfortable condition. Good, then U understand Y U can't easily break your delusion of a personal god that cant communicate ? How did it start viko_mx, how did U get emotionally attached & hypnotized to believe a bad idea with NO evidence AND Fact your god refuses to be ordered by U re prayer & refuses to respond to ALL requests for clear unequivocal communication & STILL makes people suffer ? All physics experiments have implicit predicate re progress of those experiments to a quantifiable conclusion which is repeatable & predictable - that is, a deity won't mess with the experiment (in any way) to either upset/punish the scientists OR to respond to anyone via prayer to affect the outcome at ALL ! Y is that viko_mx ? ALL experiments which achieved; alleviating of human suffering, greater communications, greater power, greater wealth, greater opportunity have NOT been affected by (any) god - ever ! In science and in life majority has never been a criterion for the quality of the ideas which defend. Defend what - bad idea of a god ? Scientists have NEVER seen any god ever interfere with ANY experiment & especially those which IMPROVE our lives, such as alleviating suffering, providing safe food eg HACCP ie Microbiology, antibiotics (did god make bacteria to hurt us? ), antibodies, advanced surgery, Cat/Pet/MRI scans, physio therapy, psychology etc None of these EVER came from a god in even a minor pathetic SMALL way in any religious work ever ! Only rational conclusion then, is that all deities are Only ideas. Moses had a idea, his "bible" ONLY EVER communicated; Status, Authority, Punishment ! No Education - ever, not even basic FIRST Aid, Y ? Breakthroughs in science are made by people who rarely take into account the ideas supported by the majority of artisans in science. Maybe, was god involved ever, if so how ?